Max Aronson was born at 713 Center Street, (a house formerly located across the street), on March 21, 1880, to Esther and Harry Aronson, a Jewish dry goods salesman. As a child, Max Aronson relocated to St. Louis, before moving to the Roth-Rosenzweig-Lambert House in Pine Bluff, Arkansas in early 1900. 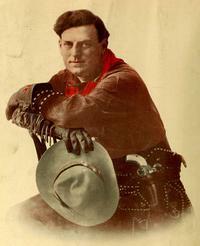 Aronson appeared in the first super hit Cowboy-Western, the Great Train Robbery (1903). Co-founding the Essanay Film company with George Spoor in 1907, Aronson directed, produced, and acted in 140 Westerns for Essanay as Broncho Billy Anderson", which garnered him worldwide acclaim. Aronson signed Charlie Chaplin to Essanay, where he made 14 comedies, including The Tramp (1915). Aronson was the producer for the great comedians Laurel and Hardy's first film together, The Lucky Dog (1921). The Academy of Motion Picture Arts and Sciences awarded Aronson an "Oscar" in 1958 for his contributions to cinema.